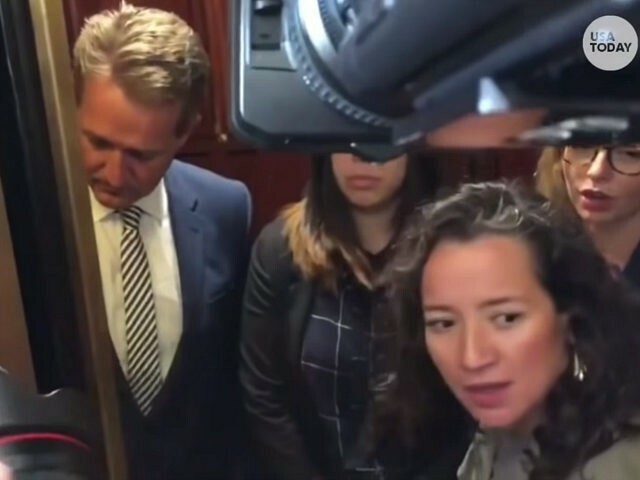 NEW YORK — Ana Maria Archila, one of the two women who confronted Arizona Republican Sen. Jeff Flake in an elevator on Friday, helps lead a progressive organization funded by billionaire George Soros that heads an $80 million activist effort characterized as part of the anti-Trump “resistance” movement. Archila and a second woman, 23-year-old Maria Gallagher, both said that they survived sexual assault when they challenged Flake as he entered an elevator prior to his Senate Judiciary Committee vote on whether to approve the nomination of President Donald Trump’s Supreme Court nominee, Brett Kavanaugh. Writing at National Review, John Fund documented Archila’s ties to the CPD and also noted she is a national committee member of the Working Families Party, which has long had close links to the now-defunct, controversial ACORN.